Crimping machine is a kind of machine used to crimp the bottom flange of high voltage insulators in insulator production. With high pressure from hydraulic power force, crimping machine press the metallic flange from all direction and make the metal fittings (flange) well attach the core of composite insulators. Crimping machine is also used for pipe production in some area. Why do we need an insulator crimping machine? Crimping technic is a mature technology used in modern insulator production. As composite insulator is widely used in overhead power lines and substation sites, the attaching and cohersion between fiber glass core and metal fittings becomes serious when mechanical load are applied to insulators. No matter composite insulator with end fittings of “ball and socket” type or composite post insulator with flange base type, the crimping technic will assure its good attaching condition to support specific mechanical force, tensile or cantilever. The crimping machine makes it possible. Why choose crimping machine from Contune International? 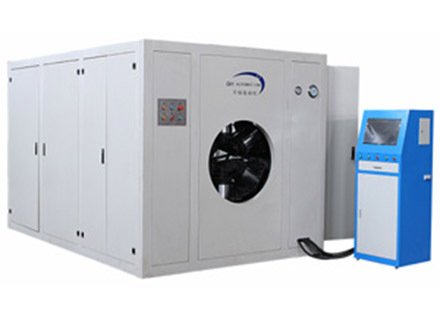 Contune Intl is a professional manufacturer of machines. We have been dedicated to design, development, production and service of industrial machine in electrical filed, including testing machines for insulators, wires, cables, conductors and productions machines like crimping machines. The insulator crimping machine from Contune Intl is specially designed and optimized to overcome problems in insulator manufacturing process. With single cylinder providing hydraulic power, structure has been simplified to have more stability, 8 dyes with synchronized movement and equal pressure force make it possible to crimp flange in all directions and avoide crack of fiber glass core. The opening diameter is also one of the advantages of our crimping machine. It can open in wider range to suit big post insulator with huge flange base. Besides mechaical aspects, software controlling of our crimping is also more advanced. Machine sensor will automatically detect every step of crimping procedure and display important value live on LED screen for easy observation and judgement. What about technical support for this crimping machine? Contune international has close cooperation with famous machine manufacturer “Zibo Qianheng Automation”, we have a complete team of engineers providing technical support via possible means: telephones, e-mails, skype online, webpage inquiry and etc. And technical inquiry is free for our clients.